The Best Gem blogs from thousands of top Gem blogs in our index using search and social metrics. Data will be refreshed once a week. Gem newsletter is a comprehensive summary of the day's most important blog posts and news articles from the best Gem websites on the web, and delivered to your email inbox each morning. To subscribe, simply provide us with your email address. India, Bangalore About Blog At Gemstoneuniverse, the larger idea is to spread awareness about the power of precious gemstones and to make available a platform for natural, untreated and potent gemstones. The mission is to be the world's leading authority on Jyotish Gemstones, Planetary Gemology and Planetary Gem Therapy and to build awareness and acceptance of Planetary Gem Therapy as a powerful tool for personal change. Facebook fans 529,585. Twitter followers 4,971. India About Blog Know everything about gemstones and gemology with GemLab blog posts. Follow to get the latest blog updates about gemstones news & events. Facebook fans 714. Twitter followers 3,119. Gurgaon About Blog A blog that is your complete guide to everything about precious and semi-precious gemstones. Know all about gemstone properties, astrological benefits, wearing procedure of gemstones, Trivia and and gemstone updates from around the world. Facebook fans 2,154. Twitter followers 549. New Delhi, India About Blog Brahma Gems M/s Aarush gems Pvt. Ltd. have been associated with all kinds of gemstones for the past 12 years and aspire to maintain our legacy in the same in the years to come. At Brahma Gems each stone is selected, graded, and examined by the group of expert Gemologist to provide the consistent quality and the authentic stones each time. Facebook fans 6,770. Twitter followers 16. Georgia About Blog Discover one-of-a-kind gems and jewelry in the Gem Shopping Network blog. Facebook fans 123,562. Twitter followers 663. Elkton, MD About Blog Sitara Collections is a social enterprise empowering women artisans around the globe, helping to keep traditional handicrafts alive. The blog focuses on various topics including healing gemstone meanings, bohemian lifestyle, handmade jewelry and inspiration for mind body and spirit wellness. Facebook fans 12,492. Twitter followers 2,514. London, UK About Blog Discover the world of Astley Clarke, featuring exclusive interviews, jewellery collections, jewellery guides, celebrities and style tips. We design refined and colourful gemstone and diamond jewellery that epitomises relaxed luxury. Facebook fans 27,312. Twitter followers 10,664. About Blog Since 2003, 9Gem has been selling gemstones to customers all over the world. We provide high quality certified gemstones to jewelers, Astrologers and gemstone collectors for so many years. Explore the blog to find useful information about the precious stones. Facebook fans 10,943. Twitter followers 2,608. About Blog The jewelry experts at Diamondere share the secrets learned over a 100 years of designing and manufacturing. Follow to find some interesting facts about gemstones. Facebook fans 12,965. Twitter followers 304. Lajpat Nagar, New Delhi About Blog Shubh Gems, are Passionate about Gemstones & Jewellery. Shubh Gems deals in 100% Natural, Untreated & Best Quality Gem stones & Designer Jewellery. Our endeavor is to educate & create awareness about Gemstones. Facebook fans 8,145. Twitter followers 184. About Blog Moonstone Magic is a young, bohemian lifestyle brand creating jewelry for all the Moon Children with a wild heart. Facebook fans 148,646. Twitter followers n/a. About Blog World of Gemstones is a blog dedicated to gemstones and useful knowledge about the precious stones. Follow to find interesting facts and information. Edina, Minnesota About Blog Dakota Stones provides top quality semi-precious gemstone beads in unique cuts for the most creative jewelry designers and artists. Dakota Stones is a brand of semi-precious gemstone beads & buttons. Facebook fans 3,408. Twitter followers 543. London, England About Blog Follow to find your birthstone and get useful insights by reading the blog. Facebook fans n/a. Twitter followers 1,665. Amritsar, India About Blog Sehdev Jewellers is a physical distributors arm of precious Gemstones, based in Amritsar-Punjab and has been working in the jewellery business in the India since 1998. Get useful insights of gemstones like Rubies, Sapphires, Emeralds, and Corals. Facebook fans 2,918. Twitter followers 247. India About Blog Yellowsapphire.org.in is a venture of Venus Enterprises established in the year 2003. Check the blog for latest updates about yellow sapphire gemstone (Pukhraj Ratna) and find complete information and knowledge about pukhraj gemstone. Facebook fans 1,806. Twitter followers 1,063. About Blog Shaman Sisters™ was created out of our passion for helping others transform their lives for the better. Shaman Sisters love creating jewelry with genuine gemstones that bring positivity, healing, empowerment, and protection. Facebook fans 15,740. Twitter followers 442. Zihuatanejo, GRO, México About Blog In this blog you will find useful tips and facts related to gemstones. Facebook fans 5,696. Twitter followers 39. New York, USA About Blog Dazzling Rock offers an incredible selection of 100% natural gemstones and gemstone jewelry, specializing in Sapphires, Rubies, Emeralds, Tanzanites, Aquamarines and Diamonds. Stay up to date with the latest diamond jewelry trends. Dazzling Rock jewelry blog features must-read articles, tips and expert advice helping you to make your day special. Facebook fans 10,731. Twitter followers 1,228. Mansfield, Nottinghamshire About Blog Jollys Jewellers are a family run chain of jewellery shops and jewellers supplying fine antique and modern jewellery. Keep up-to-date with the latest news and blogs from Jollys Jewellers. Facebook fans 707. Twitter followers 378. Gold Coast, Queensland About Blog Seda Gems is a gemstone trading company based in Australia created by Ross Sedawie. Ross is also a skilled gemstone cutter and a member of the Australian Facetors Guild. Many of the stones you will see on this website have been hand picked and cut by Ross himself with the most critical eye. Facebook fans 2,205. Twitter followers 754. About Blog Established by Howard Cohen of HSC Communications in 2011, The Jeweler Blog currently serves 183 jewelers throughout the U.S. and Canada. Find useful insights of jewelry, gemstones and precious metals. London, ish About Blog Nikki Stark Jewellery's blog features interesting information about gemstones. Facebook fans 1,327. Twitter followers 1,826. Florida Keys About Blog Healing gemstone jewelry designed to assist in your yoga practice, to inspire deeper meditation practice and to help balance your chakras. Facebook fans 861. Twitter followers 1,768. Peoria / Bloomington, IL About Blog Since 1953, Bremer Jewelry has helped thousands of happy guests across Central Illinois and beyond to “Open the Possibilities”. In this blog post Bremer Jewelry explores the origin and composition of emerald, its significance in history and modern celebrity culture, and how to shop for top quality emeralds. Facebook fans 16,000. Twitter followers 314. About Blog Exclusive gemstones in radiant colours. Mandarin garnet, imperial topaz, Paraiba tourmaline: these stones, and many more, are to be found in Constantin Wild's treasure chamber. About Blog The Oldest and Most Trusted Name for Astro-Jyotish Gemstones & Rudrakshas (Since 1937). 100% Pure, Natural, Un-treated, High-Quality, Well Cut, Powerful, Potent, Astrologically approved, Purified and Energized by Ancient Vedic Planetary Mantras, Jyotish quality Vedic Gems,powerful Rudrakshas and Vedic Talismans (specially designed sacred jewellery pieces made with pure and powerful gems according to one's personal Vedic horoscope) for astrological healing according to the ancient Vedic science. Facebook fans 265. Twitter followers 754. Los Angeles, CA About Blog JupiterGem has been providing the jewelry trade with precious and semi-precious gemstones for over four decades. We are located in the historical heart of the Los Angeles Downtown Jewelry District. Find a wide collection of exceptional gems that consist of only natural gems. Facebook fans 1,401. Twitter followers 454. Fayetteville, Arkansas About Blog Learn about gemstones and their significance. Follow to know more. Facebook fans 1,593. Twitter followers 347. About Blog The blog features interesting information about gemstones. Follow to know more. Victoria, BC, Canada About Blog The Online Jeweller is a Victoria, B.C., Canada, based jewellery BLOG created and maintained by Frans Jonker and is dedicated to sharing my passion, and expertise, on diamonds, gemstones, watches, and all things jewelry with other like-minded folks. Facebook fans 31,012. Twitter followers 18,129. Las Vegas, Nevada About Blog The American Gem Society was founded in 1934. We are an association of jewelry professionals dedicated to consumer protection, and the highest standards of both gemological education and ethical business practices. We created this blog to help inform and educate you, the jewerly-buying (and jewelry-loving) public. Facebook fans 288,526. Twitter followers 16,235. About Blog A Matter of Brilliance is a professional jewelry appraisal and estate appraisal company based in Newton, MA, founded by Aimee Berrent, Graduate Gemologist. About Blog Andrew Mazzone Design Jewellers, a family owned business situated in the heart of Adelaide. Andrew Mazzone Design Jewellers is renowned for exquisite wedding jewellery, engagement rings, and fashion jewellery. Facebook fans 9,104. Twitter followers n/a. Scotland, United Kingdom About Blog Franki Baker is a jewellery brand featuring wide range of high quality fashion and handmade colourful natural gemstone and 925 sterling silver jewellery for women and men, including earrings, bracelets, pendants, necklaces, bridal jewellery and cufflinks. Franki specialises in classic timeless jewellery pieces made from non allergenic 925 sterling silver and beautiful high quality gemstones. Facebook fans 33. Twitter followers 15. Alpharetta,GA. About Blog Iroff & Son is dedicated to providing useful information about diamonds. Facebook fans 2,776. Twitter followers 436. United Kingdom About Blog Nineteen48 is a commercial enterprise with a social conscience. Nineteen48 brings you ethically-sourced gemstones from Sri Lanka. Facebook fans 946. Twitter followers 891. Westmount, Qc About Blog Daisy's weekly blog gives tips and ideas in antique jewellery, silverware and Canadian art. Facebook fans 478. Twitter followers 15. New York - Sydney - Thailand About Blog Opal by Anderson Beattie is the leading purveyor of the finest opal jewelry in the world. We specialize in producing handmade and custom designed opal jewelry to suit the unique characteristics of each individual gemstone. Facebook fans 32,692. Twitter followers 2,866. About Blog Gem Ratna provides information about emerald, south sea pearls, ruby, topaz, cats eye stone, opal and amethyst gemstone. Follow to know more. Bangkok, Thailand About Blog First incorporated in 1959, Thai Native Gems is one of Thailand's oldest gemstone wholesalers and is dedicated in providing high quality precious stones, diamonds and jewelry to clients around the globe. Follow the blog for all your gemstones, diamonds and jewelry needs. Facebook fans 2,100. Twitter followers 204. Dubai UAE About Blog Gemme Couture is an exclusive jewelry line which creates unique pieces from precious and semi-precious stones and fine South Sea and Tahitian pearls, integrated in unexpected settings of gold and leather. Facebook fans 5,491. Twitter followers 100. Pinecrest, Miami, Florida About Blog Turley Jewelers is a retail jewelry store in Pincecrest, Miami Florida. In this blog you will find up-to-date articles on your favorite gemstones, preowned and vintage watches, jewelry care, fashion tips, and more. Facebook fans 4,549. Twitter followers 2,074. Beverly Hills, CA About Blog Find some interesting facts about birthstones. Follow to know more. Facebook fans 51,724. Twitter followers 690. About Blog Monthly Birthstones provides interesting and accurate information about all aspects of the gemstones that are assigned as birthstones. Facebook fans 955. Twitter followers n/a. Bengaluru, India About Blog Ruby, garnet, emerald & many other stones related to each Rashi in a completely different manner. Know more about gems to enhance peace, tranquility, success and health in your life. About Blog Specializing in masterful wire-wrapping of uncommonly rare gemstones from Michigan and throughout the world. About Blog Treasure, gemstones, gold, art, antiquities, jewels, auction, art auction. USA About Blog Gemselect is an exporter of loose colored gemstones and fine custom-made natural gemstone jewelry from Thailand. GemSelect company was founded in 2003 and operates under the business name South East Thailand Trading Company. Facebook fans 7,582. Twitter followers 1,534. About Blog Learn more about gemstones and their significance. Follow to know more. Minneapolis, MN About Blog Super Karin Jewelry is fun, bold and colorful. Recycled sterling silver & lab-grown gemstones make up bright cocktail rings and graphic earrings and necklaces. Facebook fans 954. Twitter followers n/a. New York About Blog Madison Gems is a fashion jewelry & accessories e-boutique that was founded on one woman's passion for bling and a desire to share her paragon statement style globally. Madison Gems was founded in May 2014, in Queens, New York as a way for CEO and Founder, Ify Onwualu and her three sisters, to enjoy wearing beautiful and quality fashion jewelry without spending a fortune. Facebook fans 1,751. Twitter followers 441. About Blog Federal Way Custom Jewelers, making original, affordable custom jewelry for men and women, featuring diamond engagement and wedding ring sets and colored gemstone jewelry since 1955. Follow to find a vast collection of one-of-a-kind colored gemstones personally sourced from around the world. About Blog Nomads is a gem house with a global presence that works with a diverse array of gemstones from across the world, focusing on fine material and precise cutting. The goal is to turn each rough crystal into the best conceivable gemstone it could possibly be. Facebook fans 28,634. Twitter followers n/a. Los Angeles, CA About Blog Himalayan Gems and Jewelry is one of the few commercial firms in the World to commercially and officially export Afghan gemstones from the mines of Afghanistan Worldwide. Facebook fans 538. Twitter followers 2,025. NY-NJ About Blog Find information about Healing Stones, Crystals, Gems, Minerals and Spiritual Products. Facebook fans 2,915. Twitter followers 275. Poynton & Stockton Heath About Blog A blog by Christopher Evans featuring some useful knowledge about gemstones. Facebook fans 273. Twitter followers 235. George Street, Sydney CBD About Blog A blog by Karen featuring useful and interesting information about gems. Facebook fans 505. Twitter followers 184. About Blog Silver City is Central Florida's original precious metals dealer. Established in 1977 in Ocala, Silver City has a huge inventory of new, custom made, and hand-selected estate jewelry for sale, an expert team of jewelry buyers, and a jewelry repair department with over 65 years of combined experience. Facebook fans 461. Twitter followers 5. Seattle, Washington About Blog Six Sisters Beadworks is based out of Michelle’s home studio in beautiful Western Washington, USA. In 2006, Michelle launched her jewelry business with the goal of introducing to others, a gorgeous line of timeless keepsake gifts meant to be cherished for a lifetime. Facebook fans 10,748. Twitter followers 168. India, Jaipur About Blog The Gemstone Queen explores gemstones in everyday life, jewellery, fashion, astrology and everywhere else. Learn all there is to know about gemstones here. About Blog Elena Cave is the sole designer and photographer behind Cave Gemstones. She loves the creative process of combining different colored genuine gemstones and metal components to create unique, elegant jewelry designs. Find articles and sometimes videos on trending jewelry techniques. Whitchurch, Shropshire About Blog The blog features some interesting facts and information about gemstones. Facebook fans 1,606. Twitter followers 274. About Blog GemstoneWorld.com is a website dedicated to gemstones, rocks and mineral education. Follow to get the latest updates and content on a regular basis. India About Blog Red Coral / Moonga Gemstone For Mars Red Coral, also called Moonga in Hindi, is a gemstone worn to pacify the malefic influence of the astrological planet Mars or Mangal. Get useful and interesting information about the Red Coral / Moonga Gemstone. Facebook fans 3,526. Twitter followers 1,225. Indiana, USA About Blog Get useful insights about gemstones. Follow to know more. Facebook fans 6. Twitter followers 1,121. About Blog The blog features rare gemstones containing inclusions and natural features which make each one as unique as every individual. Highworth About Blog Lilia Nash jewellery is a unique collection of fine hand made eco-friendly gemstone jewellery specialising in bespoke engagement and wedding jewellery, birthstone jewellery, earrings and necklaces. Lilia’s mission is to make her jewellery using recycled and ethical metals, conflict free diamonds and fair trade gemstones in order to try and reduce the amount of damage to the environment. Facebook fans 5,327. Twitter followers 625. Sydney, Australia About Blog Kate McCoy creates beautiful stylish fine jewellery. A gemologist & diamond grader Kate specialises in bespoke engagement rings & wedding rings. Take a peak at the behind-the-scenes world of Kate McCoy for exclusive updates, photo shoots, favourite gemstones, industry secrets, buying guides and exhibitions. Facebook fans 813. Twitter followers 98. Roswell, Georgia. USA About Blog JWO Jewelers specializes in Jewelry Sales & Repair. Read our Blog and find out more about Gemstones, Diamonds and More. Our Articles include Birthstone Information & History. Facebook fans 2,814. Twitter followers 14. India About Blog Emerald.org.in is a venture of Venus Enterprises established in the year 2003. Check the blog for all types of information about the emerald / Panna gemstones. Facebook fans 1,987. Twitter followers 1,614. Nairobi, Kenya About Blog Initially incorporated as a mining company in 1974, we have been involved in all facets of the colored gemstone trade in our many years active in the industry. We know gemstones and the gem trade from the bottom of the supply chain to the top. In this blog you will find all the useful information related to precious stones. Facebook fans 1,475. Twitter followers 599. About Blog Sunken Treasures inspires people everywhere to embrace their own inner strength and celebrate their personal path through life. Ontario, Canada About Blog Blog by Erynn Guild, I have created Bobbi’s Gem Journal because I am genuinely obsessed with gemstones, diamonds, yellow gold, and craftsmanship. I enjoy jewellery designers and wanted to highlight them along with gemstones. To share with you the reader my passion for jewellery. Facebook fans 131. Twitter followers 36. Durango, Colorado USA About Blog Durango Silver Company is an American Family Owned Handmade Silver and Gold Jewelry Company Specializing in Natural American Turquoise. Facebook fans 2,914. Twitter followers 320. About Blog Gemmings.com is your curated store for gemstone accessories, gemstones bracelets, gemstone necklace, birthday gemstones, watches and fashion accessories. Follow the blog to know more. About Blog Tsavorite Green Garnet is an online jewelry retail company selling high quality finished goods. Follow to find natural earth-mined garnets. About Blog We at fematta.com wish to add value to every customer in exploring all possible avenues. We believe that every individual is a unit and part of the whole. The whole cannot exist without units. Our Endeavour is to give Life Solutions to our customers to make their life comfortable. Facebook fans 105. Twitter followers 8. About Blog Find a wealth of info on crystals and gemstones. Follow to know more. Facebook fans 29,921. Twitter followers 218. About Blog Stones are a passion for us and each one is unique. We are learning that gemstones and metals have different meanings and healing powers. RiverRock's aim is to provide quality jewelry that will be enjoyed for years to come. Follow the blog to know more. Georgia, USA About Blog Pebblus Gold is a fine jewelry and exotic gemstone shop where we offer one-of-a-kind collections of fine dimonds, gemstones and pearls set in Gold or .925 Sterling Silver. Learn more about gems by reading the blog. Facebook fans 106. Twitter followers 5. CONGRATULATIONS to every blogger that has made this Top Gem Blogs list! 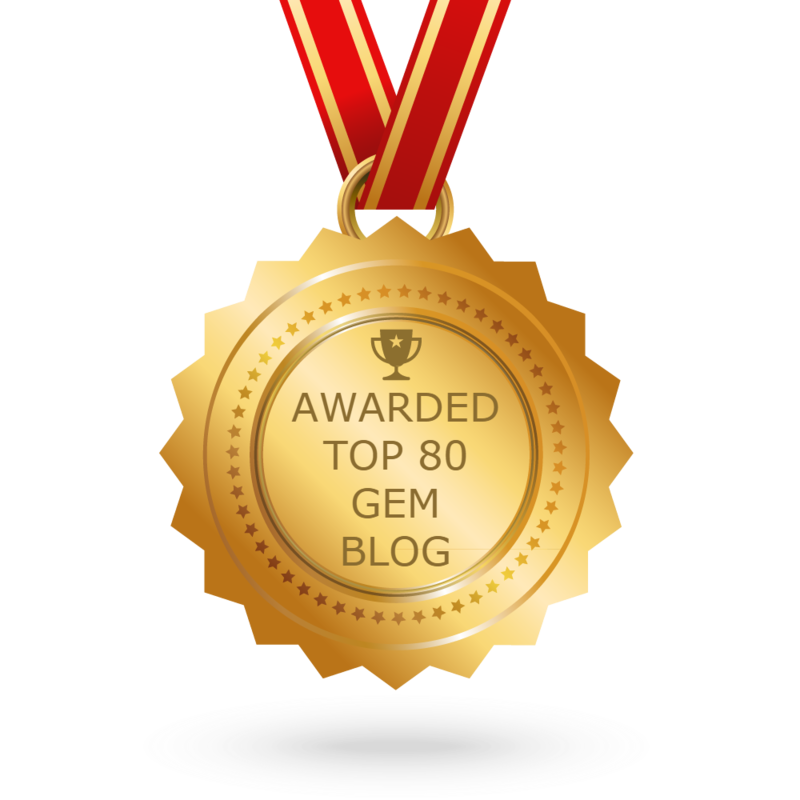 This is the most comprehensive list of best Gem blogs on the internet and I’m honoured to have you as part of this! I personally give you a high-five and want to thank you for your contribution to this world.